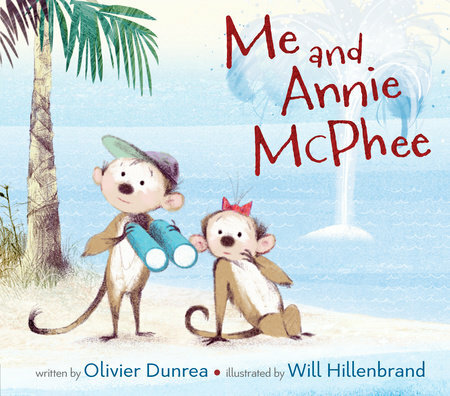 Me and Annie McPhee brings picture book pros Oliver Dunrea and Will Hillenbrand together for a rhyming, counting story filled with funny animals doing unexpected things, all on "one tiny island." Me and Annie McPhee begins, "In the middle of the sea, as far as the eye could see, there was nothing to see but sea." And who is seeing all this sea? The narrator and Annie McPhee, and they fit on an island that is just big enough for the two of them. But, they are not alone. There are dogs who think they are frogs, perky pigs all wearing wigs, baby geese all named Maurice and "sleek snails sliding on shale," among many others. Dunrea's rhymes are so silly and tongue-twister-y, that reading Me and Annie McPhee out loud is a fun challenge. Hillenbrand uses a gentle pastel palette, tucking little clues into every illustration, hinting at the next animal to arrive. Just as the island seems to reach peak capacity, little Annie McPhee reaches her limit, proclaiming, "TOO CROWDED FOR ME!" Happily, a surprise visitor arrives (clever eyes might have spotted this visitor early on in the story) and the narrator and Annie head off for another adventure. Me and Annie McPhee is a book that little listeners will definitely ask to hear over and over again.